Objective: To elucidate the genetic cause of an Egyptian family with dopa-responsive dystonia (DRD), a childhood-onset dystonia, responding therapeutically to levodopa, which is caused by mutations in various genes. Methods: Rare variants in all coding exons of GCH1 were excluded by Sanger sequencing. Exome sequencing was applied for 1 unaffected and 2 affected family members. To investigate the functional consequences of detected genetic variants, urinary sepiapterin concentrations were determined by high-performance liquid chromatography. Results: A heterozygous rare nonsynonymous variant in exon 1 of sepiapterin reductase (SPR, c.207C>G, p.Asp69Glu) was found in all affected family members. Urinary concentrations of sepiapterin were above the standard of normal controls in most SPR mutation carriers, suggesting functional biochemical consequences of the mutation. Variant filtering of all genes involved in the tetrahydrobiopterin pathway, required for levodopa synthesis, revealed an additional common variant in dihydrofolate reductase (DHFR, rs70991108). The presence of both variants was significantly stronger associated with the biochemical abnormality and the clinical disease state as opposed to 1 variant only. Conclusions: The rare SPR mutation can cause autosomal dominant DRD with incomplete penetrance. The common DHFR variant might have synergistic effects on production of tetrahydrobiopterin and levodopa, thereby increasing penetrance. Dopa-responsive dystonia (DRD) encompasses a group of movement disorders with heterogeneous clinical and genetic manifestations, presenting with childhood-onset limb dystonia and response to levodopa therapy.1 Additional neurologic presentations may include parkinsonian and pyramidal features.2,3 Variants in the gene of GTP cyclohydrolase I (GCH1), a key protein of the tetrahydrobiopterin (BH4) pathway, required for the biosynthesis of levodopa (figure, A), are the most frequent cause of autosomal dominant DRD, also known as DYT5a.1,4 Variants of sepiapterin reductase (SPR), encoding another key protein of the BH4 pathway (figure, A), have been identified in autosomal recessive DRD.5 At present, only 1 patient with DRD without family history has been identified with a heterozygous SPR variant.6 Here, we describe the first DRD family carrying a rare SPR variant (c.207C>G, p.Asp69Glu, chr2:73114768_C>G, undetected in 8,599 alleles annotated in the Exome Variant Server) with autosomal dominant inheritance and incomplete penetrance. Affected and nonaffected individuals of a family of Egyptian origin were examined by neurologists specialized in movement disorders (A.S.S. and G.U.H.) at the Department of Neurology, Ain Shams University, Cairo, Egypt. Ethical approval was obtained at Ain Shams University (RP/42) and Technical University of Munich (203/15s). All participants provided written informed consent. Consanguinity was excluded by interview and genetic analyses. After excluding known rare variants in all 6 coding exons of GCH1 by Sanger sequencing, exome sequencing was applied to 1 unaffected and 2 affected family members. Genomic DNA libraries were captured using the Nextera Rapid Capture Expanded Exome Kit (Illumina, San Diego, CA), and DNA fragments were sequenced on an Illumina HiSeq2000 system. Variants were identified by a standard analysis pipeline. Variants with a minor allele frequency (MAF) >0.1%, based on >6,500 (The National Heart, Lung, and Blood Institute Exome Sequencing Project, version ESP6500siv2), were discarded. Assuming a dominant disorder, only nonsynonymous variants were retained as candidate alleles, including missense, nonsense, stop-loss, and splice-site mutations, as well as small insertions and deletions present in the heterozygous state and present in both affected sisters (figure B, II.2 and II.4). Hypothesis-based variant filtering was applied to all genes in the SPR pathway, also considering variants with an MAF >1.0%. Candidate variants were validated by Sanger sequencing and cosegregation with disease in the family (table 1). The effects of amino acid substitutions on protein function were predicted using MutationTaster (mutationtaster.org), PolyPhen-2 (genetics.bwh.harvard.edu/pph2), and CADD (cadd.gs.washington.edu). Mutagenesis analysis was performed with PyMOL (pymol.org) based on the SPR protein structure 4XWY (PDB file). Functional protein domains were analyzed using HaploReg v4.1 (broadinstitute.org/mammals/haploreg/haploreg.php). First-void urine was collected, protected from light, immediately placed on dry ice, and stored at −80°C. For sepiapterin quantification, samples were prepared as described7 and subjected to high-performance liquid chromatography analysis on a C18 reversed-phase column (Spherisorb ODS1, 5 μm, ID 4.6 mm, L250 mm; Waters, Milford, MA) and isocratic elution with 24 mM KH2PO4 (pH 5.0)/CH3OH (85:15, vol/vol) (flow rate 1.1 mL/min over 15 minutes). A fluorescence detector (RF 20A XS; Shimadzu, Kyoto, Japan; excitation λ = 425 nm; emission λ = 530 nm) was used. Sepiapterin eluted with a retention time of 9.9 minutes. Urine samples were masked before analysis. Mean values of 4 technical measurements are presented. Descriptive analyses and χ2 statistics were calculated using Statistica 8.0 (StatSoft Inc., Tulsa, OK). Data are presented as mean ± SEM. p < 0.05 was considered statistically significant. We examined 5 affected and 4 nonaffected family members (figure, B). Symptom onset was between childhood and puberty (table 2). Patient II.4 presented with lower limb dystonia (tiptoe walking) and rigidity since childhood, with progressive course and diurnal variation. He improved markedly with l-DOPA, however with low-threshold drug-induced dyskinesia. His current medication comprises fractionated l-DOPA doses (750 mg/d), anticholinergics, and amantadine (400 mg/d). The other affected individuals showed diurnal lower limb dystonia, rigidity, and mild pyramidal signs. Patients (II.2 and II.5) experienced symptomatic benefit with l-DOPA and continued on pramipexole. Patients III.2 and III.3 were not treated with l-DOPA because of their young age, mild symptoms, and fear of their parents of l-DOPA–induced dyskinesia. We found a nonsynonymous heterozygous variant in exon 1 of SPR (NM_003124.4 c.207C>G, p.Asp69Glu, genomic [GRCh37]: chr2:73114768_C>G) in all affected family members. In SPR, aspartate 69 is involved in binding the cofactor nicotinamide adenine dinucleotide phosphate (NADPH). In silico mutagenesis analysis predicted that the longer and more flexible side chain of glutamate 69 in mutation carriers leads to an increased distance and loss of hydrogen bonds to NADPH (figure, C). Structural gene/exon variations of SPR were checked in the 3 samples in which whole-exome sequencing was performed using the BreakDancer tool (github.com/genome/breakdancer).8 We did not detect such an event near SPR or elsewhere on chromosome 2. In addition, we found an intronic 19 base-pair insertion (rs70991108) in an active transcription start site of the dihydrofolate reductase (DHFR) gene in all affected family members (table 2). This variant alters 8 regulatory motifs (HaploReg). The family member without the SPR variant (II.1) had normal sepiapterin concentrations and was healthy. From the 8 SPR variant carriers (table 2), 7 had elevated sepiapterin concentrations; 5 of those were clinically affected. From 2 members without the DHFR variant (I.2 and III.1), 1 had elevated sepiapterin values, but both were healthy. From 7 DHFR variant carriers (table 2), 6 had elevated sepiapterin concentrations; 5 of those were clinically affected. Six family members carried both SPR and DHFR variants (table 2); all of them had elevated sepiapterin concentrations; 5 of them were clinically affected. There was a significantly stronger association of both variants simultaneously with the biochemical abnormality (χ2 5.1429, p < 0.05) and the clinical disease state (χ2 5.625, p < 0.05) as opposed to only 1 variant. We identified a rare heterozygous variant of SPR in a family with DRD segregating as autosomal dominant trait (figure, B and table 2). SPR is essential for levodopa synthesis. In silico analysis suggested pathogenicity of this variant. Consistently, we found slightly elevated urine sepiapterin concentrations in 7 variant carriers, 5 of these presenting clinical symptoms. Since also 3 nonaffected siblings carried this variant, incomplete penetrance was assumed. Other SPR variants are known to cause autosomal recessive DRD. A heterozygous SPR variant in a single patient with DRD without family history had already indicated the possibility of autosomal dominant causality of SPR variants.6 These observations suggest that this SPR variant has autosomal dominant pathogenicity with incomplete penetrance. In the same family, we also identified a DHFR variant (rs70991108). In silico analysis suggested a potential effect of this variant on protein expression. Consistently, we found elevated urine sepiapterin concentrations in 6 and clinical symptoms in 5 of the 7 variant carriers. Two nonaffected siblings carried the variant as well. Because of its relatively high allele frequency in the general population,9 we do not assume this variant to be pathogenic per se. Of interest, the presence of the common DHFR variant in addition to the SPR variant significantly increased the risk of the presence of the biochemical abnormality (elevated sepiapterin urine concentrations) and of clinical symptoms. The 1 sibling carrying both variants (SPR and DHFR) without clinical DRD symptoms might be either in a preclinical disease stage or might be protected by unknown resilience factors. While high DHFR expression in the liver may account for a modest biochemical phenotype in the periphery, the very low cerebral DHFR expression might be further reduced by the variant, leading to a clinically significant disturbance of l-DOPA synthesis.10 This suggests that the presence or absence of the common DHFR variant affects the penetrance of the autosomal dominant SPR variant. With regard to the sequential metabolic function of the SPR and DHFR gene products in the l-DOPA synthesis pathway (figure, A), this interpretation appears plausible. 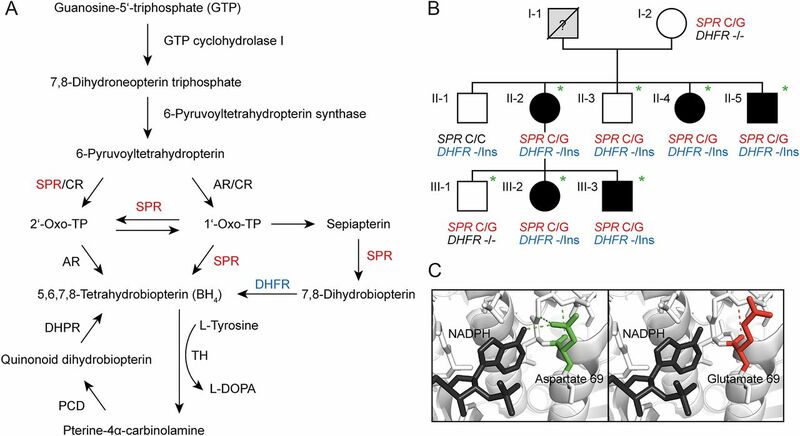 The SPR-DHFR pathway metabolizes sepiapterin to generate tetrahydrobiopterin, essential for the formation of l-DOPA. The enzymes SPR and DHFR are serially catalyzing this reaction. Homozygous mutations affecting SPR on both homologous chromosomes impose a massive bottleneck within this pathway and are known to cause DRD. A heterozygous mutation affecting SPR on only 1 chromosome imposes a minor bottleneck for this pathway. The clinical penetrance of this condition may thus depend on additional cofactors affecting this pathway, such as epigenetic silencing of the healthy SPR allele. In our family, this cofactor seems to be the co-occurrence of an additional variant in the downstream enzyme DHFR, causing a “tandem stenosis” within this pathway. Taken together, the present study proposes the rare SPR c.207C>G variant as a cause of autosomal dominant DRD with incomplete penetrance and the common DHFR rs70991108 variant as a potential modifier, significantly affecting the penetrance of the SPR variant. Ali S. Shalash: study concept and design, acquisition of data, analysis and interpretation of data, and critical revision of the manuscript for intellectual content. Thomas W. Rösler: study concept and design, acquisition of data, analysis and interpretation of data, study supervision, and critical revision of the manuscript for intellectual content. Stefanie H. Müller: acquisition of data, analysis and interpretation of data, and critical revision of the manuscript for intellectual content. Mohamed Salama: study concept and design, acquisition of data, analysis and interpretation of data, and critical revision of the manuscript for intellectual content. Günther Deuschl: study concept and design, analysis and interpretation of data, and critical revision of the manuscript for intellectual content. Ulrich Müller and Thomas Opladen: study concept and design, acquisition of data, analysis and interpretation of data, and critical revision of the manuscript for intellectual content. Britt-Sabina Petersen: acquisition of data, analysis and interpretation of data, and critical revision of the manuscript for intellectual content. Andre Franke: study concept and design, acquisition of data, analysis and interpretation of data, study supervision, and critical revision of the manuscript for intellectual content. Franziska Hopfner: study concept and design, acquisition of data, analysis and interpretation of data, study supervision, and drafting the manuscript for intellectual content. Gregor Kuhlenbäumer: study concept and design, acquisition of data, analysis and interpretation of data, study supervision, and critical revision of the manuscript for intellectual content. Günter U. Höglinger: study concept and design, acquisition of data, analysis and interpretation of data, study supervision, and drafting the manuscript for intellectual content. Supported by the German Academic Exchange Service (DAAD, Grants: 56502692, 57070724, 57162390, and 57247022). Günter U. Höglinger was funded by the Deutsche Forschungsgemeinschaft (DFG, HO2402/6-2). A.S. Shalash reports no disclosures. T.W. Rösler has served on the editorial board of Frontiers in Neurology and will receive royalty payments for a patented invention (Perk activator for the treatment of neurodegenerative diseases, WO 2016024010 A1). S.H. Müller and M. Salama report no disclosures. G. Deuschl has served on the scientific advisory boards of Medtronic, Sapiens, Britannica, and Boston Scientific; has received travel funding/speaker honoraria from Medtronic and Desitin; has served on the editorial boards of Movement Disorders, Aktuelle Neurologie, and several other journals (names not indicated); and receives publishing royalties from Thieme Publishers. U. Müller has served on the editorial board of Neurogenetics and has received research support from CurePSP. T. Opladen has received speaker honoraria from Swedish Orphan. B.-S. Petersen, A. Franke, and F. Hopfner report no disclosure. G. Kuhlenbäumer has received research support from the International Essential Tremor Foundation. G.U. Höglinger has served on the scientific advisory boards of Asceneuron, AbbVie, Bristol-Myers Squibb, Roche, UCB, Novartis, Sanofi, and Biogen; has received travel funding/speaker honoraria from AbbVie, Roche, UCB, and Movement Disorders Society; holds a patent for Method for the treatment of neurodegenerative diseases (PCT/EP2015/068734); and has received research support from Sellas Life Sciences Group, Bayerische Forschungsallianz, German Ministry of Education and Research (BMBF), German Academic Exchange Service (DAAD), German Research Foundation (DFG), German Center for Neurodegenerative Diseases (DZNE), CurePSP, International Parkinson Foundation, and NOMIS Foundation. Go to Neurology.org/ng for full disclosure forms. The authors thank Lena Jaschkowitz and Magda Berjas for technical assistance. Funding information and disclosures are provided at the end of the article. Go to Neurology.org/ng for full disclosure forms. The Article Processing Charge was funded by Klinikum rechts der Isar der TUM. Accepted in final form August 21, 2017.
. Genetics in dystonia. Parkinsonism Relat Disord 2014;20(suppl 1):S137–S142.
. Dopa-responsive dystonia—clinical and genetic heterogeneity. Nat Rev Neurol 2015;11:414–424.
. Sepiapterin reductase deficiency: a treatable mimic of cerebral palsy. Ann Neurol 2012;71:520–530.
. The monogenic primary dystonias. Brain 2009;132:2005–2025.
. Diagnosis of dopa-responsive dystonia and other tetrahydrobiopterin disorders by the study of biopterin metabolism in fibroblasts. Clin Chem 2001;47:477–485.
. Heterozygous mutation in 5′-untranslated region of sepiapterin reductase gene (SPR) in a patient with dopa-responsive dystonia. Neurogenetics 2004;5:187–190.
. Urine sepiapterin excretion as a new diagnostic marker for sepiapterin reductase deficiency. Mol Genet Metab 2015;115:157–160.
. BreakDancer: identification of genomic structural variation from paired-end read mapping. Curr Protoc Bioinformatics 2014;45:15.6.1–15.6.11.
. Low molecular weight heparin: a practical approach in deep venous thrombosis in palliative care. Indian J Palliat Care 2011;17:143–145.
. Tetrahydrobiopterin deficiencies without hyperphenylalaninemia: diagnosis and genetics of dopa-responsive dystonia and sepiapterin reductase deficiency. Mol Genet Metab 2001;74:172–185.
. Sepiapterin reductase deficiency: a congenital dopa-responsive motor and cognitive disorder. Brain 2005;128:2291–2296.